Keeping it shorter this time, since basically, I'm too broke to really do s*** now. So after a rough start with trouble at Geneva airport which ended with me missing the bus to annecy, and thusly jumping a fence and sleeping in a park instead, I had a really nice day when I arrived. I saved one nights hostel expense and the sun was shining brightly over the giant food market I stumbled into. Just walking along all these stands, running up and down narrow alleys, with the smell of cheese, so strong you can basically taste it, was precisely why I went to France. A sample there, a taster there... I must've tried ten different sausages and at least five different cheeses. Then I just strolled around town. 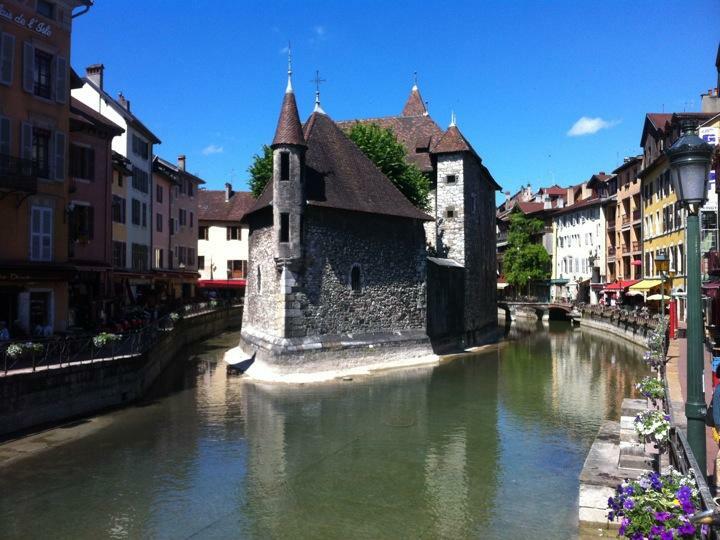 Annecy is the living embodiment of a quaint little alp village when you just walk through the Old Town. On every corner, there is someone making fresh crêpes, and any way you turn, you see homemade ice-cream (although I'm saving my ice-cream money for Italy). Also, I ended up walking up one of the mountain tops overlooking annecy, mostly by accident, but rarely has a cold one been so deserved afterwards. The evening was spent hanging with two Irish guys and a Canadian couple, plus the hostel owners. The next day I went for a biking trip around the lake, which looked pretty darn big on a map. I heard something between 30 and 40 km, so not that enormous, but a fair trip. It turned out to be quite flat the first half, and just warm enough to feel comfortable, and still not die from overheating. The sun was a killer though... Didn't realize 'til I came home that my forehead was toast, and way to late. Still a gorgeous view all along the route, and the bike track was far enough from the road that you barely heard the cars pass by. Took about two and a half hours, and that was taking it nice and easy, so to enjoy it properly. Didn't really dare to leave the hostel anymore though, with respect to my newly lobsterized forehead and nose.